Christmas is coming. A time for entertaining. And what could be more entertaining than a box of pear-shaped mini-biscuits called ‘Scoops’? Scoops. There’s just something unfortunately scatological about that word. Anyway, these biscuits for clearly for loading up with dip, which is handy at one of those entertainment gatherings where there isn’t enough proper food to soak up the alcohol. Armed with these biscuits, you can get through most of a bowl of dip in just a few minutes. When I first saw these, I assumed they were just a small, shaped version of an existing biscuit. But if they are, I am not familiar with the prototype. They are actually quite nice – crunchy but not too hard, with a salty / malty taste that is quite addictive. They are perfectly snackable on even without any dip. I like them, and am gong to give them an eight out of ten. It’s Terrific Tuesday! Time for our dose of cycling good news and upbeat blogging. And today’s theme is – things wearing out. Now, I suppose this is Bad News. I mean, that’s all cost I have to bear, goods that have to be manufactured, carbon footprints to be agonised over. But actually, I feel rather positive about it. All of those things have been well used. They represent thousands of kilometres of happy cycling. Hours of safe, fun riding. Each of those things can tell a story – the places they have been, the hills they conquered, the loads they hauled. And, when examined, it’s really not that much. A few bits and bobs that have made my life easier and happier, and probably have had less impact on the world than one tank of petrol for the car. And in getting them sorted, I’ve spoken to nice people in local bike shops, chatted online with like minded souls, compared notes with other riders. 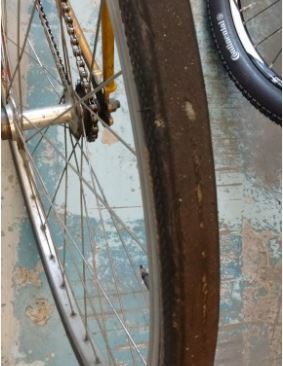 So raise a glass to bikes that get used, that wear out, that can be renewed. Not discarded capriciously, nor rendered obsolete, but simply worn out by the actions of my own muscles over months and years. It’s the best way to travel. And a good way to live. Shapes. It all seems to be about Shapes in biscuit-land at the moment. New Shapes, Original Shapes, New-but-now-original-again Shapes – it has been dominating the biscuit community for months. 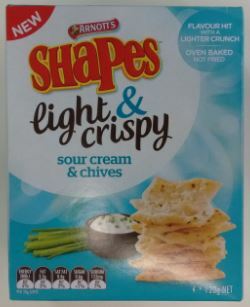 And into this maelstrom comes yet another Shapes variant – the ‘Light and Crispy’ range. 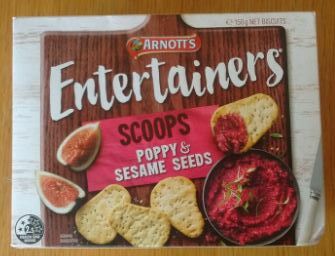 I snapped up a box to see what they were like. Well, you will remember some time ago when we started on this whole ‘savoury biscuit’ thing. At that time, I was nervous about the whole cross-over with ‘savoury snack’ thing. When does a biscuit become a snack? Well, it might just be with Light and Crispy Shapes, as these are definitely dipping a toe into the waters labelled ‘snack’, if not going for a full swim. They are very light (which, I suppose, given the name is hardly a bad thing), thin, crunchy ‘biscuits’. Yes, the packet still has them labelled as ‘biscuits’. So that’s OK then. You can very easily shovel several at a time into your mouth, which to me is a definite sign of ‘snack’. And when you eat them, they crunch down quite quickly. 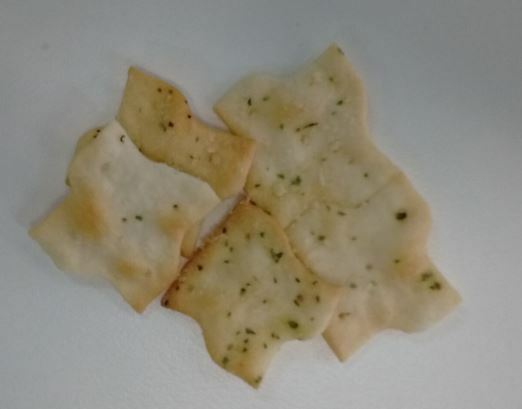 For all that, they have a nice enough texture, and the sour cheese and chive is pretty standard for the genre. Nothing stand-out, but quite pleasant. As a snack. I’m going to give these four out of ten. It’s Positive Tuesday again. Eagle-eyed readers will note that I’ve exceeded the initial promise to do six good news stories, but I figured that pushing on can’t be a bad thing. Apart from anything else it improves my mood, even if you are getting sick of the relentless positivity. And so onto the other bit of good news. I had occasion to ride through the city at peak time last week, something I now rarely have cause to do. And what struck me was how many cyclists there were. 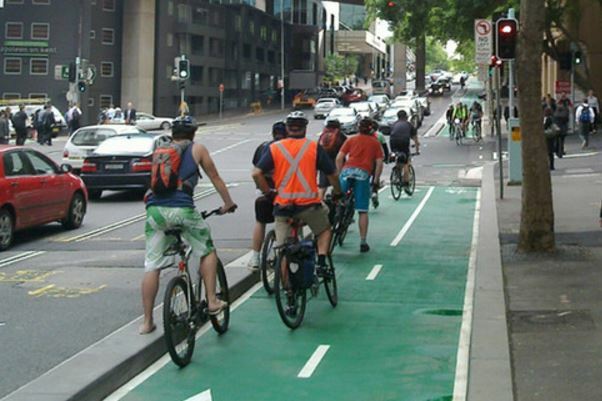 Yes, there have been reports that cycling levels have declined slightly (the NSW government are rejoicing at this, given that have also just dropped any targets they might have had for cycling participation). But when you ride in the city, you can’t help but be struck by how many cyclists there are. The best part about this for me was how courteous the motor traffic was. On my normal route to work I am a lone cyclist, and I experience inconsiderate driving often. But it really seems that, in a place where motorists are used to cyclists and accept that they are legitimate road users, they behave better. This cheered me up no end, and reinforced to me the feeling I had after visiting Manly. In NSW we have the most anti-cycling government anywhere in the world. At every turn they find ways to discourage, punish and harass cyclists. And yet cycling is happening in large numbers, with what feels like unstoppable momentum. Duncan Gay won’t kill it. The best he can do is constrain it a bit, but when finally we get a more progressive government, I sense the cork will pop and suddenly there could be a surge in cycling, benefiting everyone who lives and works in Sydney and NSW more generally. Don’t get discouraged folks. Just keep pushing those pedals. The revolution is coming.